…in which we also post a retread and a promise…. My pal Dave Hood recently left me some tips about how to approach the Hetch Hetchy aqueduct to get a field recording. We’d guess the pipes are singing much of the time. As with many such guesses there is one way to find out: head for the source. Dave has scoped out the difficulties and provided GPS coordinates to the aqueduct at key points. I was familiar with the Pulgas Water Temple outside of Redwood City, the aqueduct’s terminus. I was unaware there was another water temple in Sunol, which predates it. There’s quite a bit about the SFPUC water system I don’t know. But our speculation about the sonic potential calls out for an assay. My guess right now is the above-ground portion of the metal pipes is most likely to yield interesting sound. In a brief email exchange, I offered a link to a recording of a similar–if smaller-scale–instance: the water pipe spanning the Gerald Desmond Bridge in Long Beach. 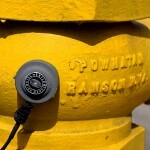 It supplies the fire hydrants and stand pipes along the roadway. It is just a four-inch steel tube full of water, about one half mile long. I was dismayed to realize that I have never posted this sound. Since Jacob and I first surveilled the Gerald Desmond in 2013, I’ve been making works and electronic instruments incorporating it. But since so many of those works are still in progress, I haven’t shared as much as I thought. So here it is. There’s plenty of low sonority in this sample. In fact, it’s mostly bass, so it doesn’t sound like much over typical built-in laptop speakers. If you’ve got a subwoofer handy, turn it on and crank the volume. The stimulus for the sound is bridge traffic–primarily container trucks–roaring by a couple of feet away and vibrating the pipe. Is this anything like the aqueduct would sound like? Probably not. The stimulus there is likely the water itself moving through the pipes. Again, there’s one way to know. The obvious challenge is, of course, the aqueduct itself. The retread is the photograph, borrowed from a prior article. The promise is to get the rest of the Gerald Desmond samples posted some day soon. I’ll probably flesh this article out in a bit. For now, enjoy the file!